I Am Now With You is a transcript of the first of seven games of Nomic played between the artist and Whitman through the multiple published versions of the poem eventually called “Song of Myself.” Nomic, created by philosopher Peter Suber as a model of democratic systems, centers on changing rules through group consensus, making each game unique. Carlsmith engaged Whitman in the game by manipulating the language of “Song of Myself” into responses in a conversation between herself and the poet, agreeing on rules and awarding points while attempting to stage an earnest personal exchange. Within the plastic landscape of text the two players alternately flirt, rebuff, and collapse into each other, exploring the edges of possibility, identity, and love. 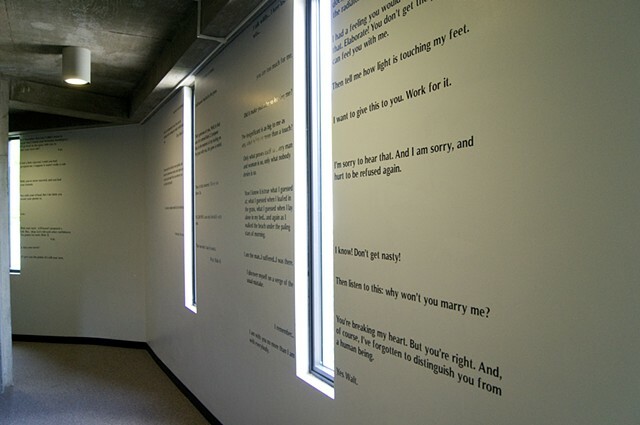 Although the text was composed as a dialogue, it is installed so that the two voices run in opposite directions, with Whitman’s beginning on one side of the hallway and Carlsmith’s on the other. This disruption highlights the temporal and spatial distance between the speakers, a crucial barrier of the work. Because the final words of both participants are the same, the texts at the farthest ends of the installation mirror one other. I Am Now With You was created for the Deering Library on the occasion of the Sixth International Walt Whitman Seminar and Symposium, held at Northwestern University in the summer of 2013. This installation is supported by the Center for Interdisciplinary Research in the Arts at Northwestern University. All players must always abide by all the rules then in effect, in the form in which they are then in effect. The rules in the Initial Set are in effect whenever a game begins. All rule-changes proposed in the proper way shall be voted on. They will be adopted if and only if they receive the required number of votes. All proposed rule-changes shall be written down and given a number for reference. If a rule-change as proposed is unclear, ambiguous, paradoxical, or destructive of play, or if it arguably consists of two or more rule-changes compounded or is an amendment that makes no difference, or if it is otherwise of questionable value, then the other players may suggest amendments or argue against the proposal before the vote. A reasonable time must be allowed for this debate. A player always has the option to forfeit the game rather than continue to play or incur a game penalty. No penalty worse than losing, in the judgment of the player to incur it, may be imposed. The adoption of rule-changes must never become completely impermissible. Rule-changes that affect rules needed to allow or apply rule-changes are as permissible as other rule-changes. Even rule-changes that amend or repeal their own authority are permissible. No rule-change or type of move is impermissible solely on account of the self-reference or self-application of a rule. Whatever is not prohibited or regulated by a rule is permitted and unregulated, with the sole exception of changing the rules, which is permitted only when a rule or set of rules explicitly or implicitly permits it. Players shall alternate, taking one whole turn apiece. All players begin with zero points. One turn consists of two parts in this order: (1) proposing one rule-change and having it voted on, and (2) throwing one die once and adding the number of points on its face to one's score. An adopted rule-change takes full effect at the moment of the completion of the vote that adopted it. If the rules are changed so that further play is impossible, or if the legality of a move cannot be determined with finality, then the first player unable to complete a turn is the winner.